The aquatic superhero everyone loves has come to life. 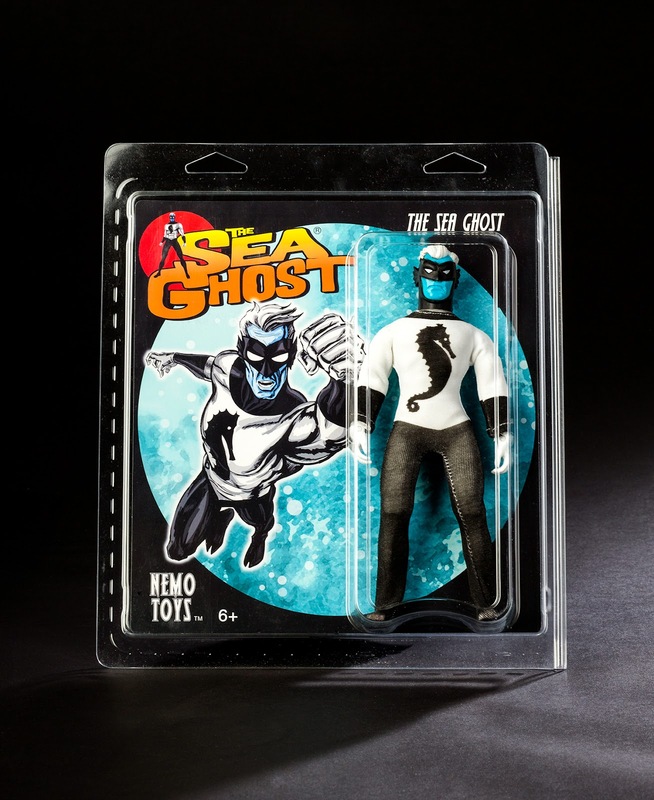 The new Sea Ghost action figure is now available in stores. Named “one of the coolest” superheroes of the seven seas byRobot 6, Sea Ghost was first seen in Jay Piscopo’s The Undersea Adventures of Capt'n Eli. He quickly became a fan favorite, appearing in his own comic book, Sea Ghost #1: The Sea Ghost in the Machine. Now he’s available as an 8” action figure. Distributed by Diamond Comic Distributors (Diamond Code: JUL142068), this collectible "maker" action figure is created in a retro-style reminiscent of those made by the Mego Corporation in the 1970s. This figure was designed by Jay Piscopo and handcrafted with assistance from Paul "Dr. Mego" Clarke. This 8” figure is packaged in a sealed clam shell and features artwork by Sea Ghost creator Jay Piscopo. It can be ordered through Diamond Comic Distributors(Diamond Code: JUL142068) or purchased directly through Nemo Publishing at http://captneli.shipyardshopping.com/index.html. About the Sea Ghost character: Sea Ghost is an aquatic super hero with a long career fighting evil above and beneath the waves. The character is an homage to golden age comic book superheroes. This character is featured in the following books, all written and illustrated by Jay Piscopo. Sea Ghost’s story is revealed in The Undersea Adventures of Capt'n Eli – Volume 2 (Diamond Code: AUG084227 | ISBN 978-0-9817132-1-2). In Volume 1 and Volume 2 of The Undersea Adventures of Capt'n Eli, fans also meet the Sea Raider, who is the Sea Ghost's former identity during WW II (Capt'n Eli Volume 1 Diamond Code: JAN111270 | ISBN 978-0-9817132-0-5). The Sea Ghost returns in The Undersea Adventures of Capt'n Eli – Volume 3 which will be released in March 2015. (Diamond Code: OCT141559 | ISBN 978-0-9817132-2-9).